One of a series (see image below) of records & cassettes released by Radiant featuring tracks taken from Judy's 1963/64 television series "The Judy Garland Show". This LP & cassette series disappeared almost as soon as it hit the stores. 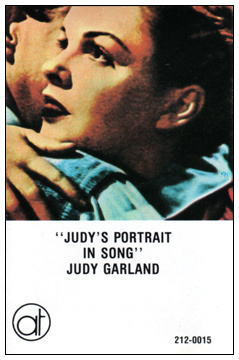 Originally 7 LPs and cassettes were planned for release, but due to legal issues, only 4 were widely released on LP ("Judy"; "Judy In Hollywood"; "The Unforgettable Judy Garland" & "Judy's Portrait In Song"). The remaining volumes ("Judy The Legend"; "Judy Greatest Hits" & "Over The Rainbow") were briefly released on LPs that are now extremely rare, and more widely released on cassette. Some of the tracks in this series were transferred at the wrong speed and most of the tracks are of dubious sound quality. Still, for a long time these were the only available records of Judy's performances from her series. Luckily, we now have newly remastered CDs with great sound quality, and transferred at the right speed, finally presenting Judy's amazing performances as they should be. Note: "Sweet Little Alice Blue Gown" [aka "Alice Blue Gown"] is actually sung by Liza Minnelli while appearing on Judy's Christmas show. 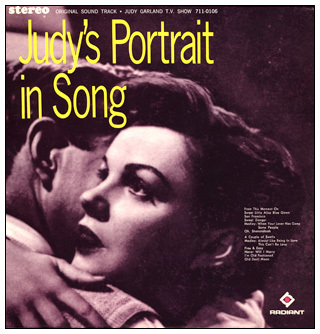 This album lists the song as though Judy performed it. 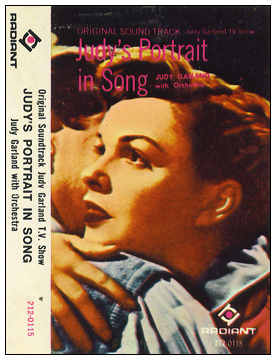 Later released on cassette (image at right) by Radiant and the "American Tape Corp." #212-0015 with the same cover art although the photo is the "tinted" version as seen in the lobby cards for Judy's 1954 film A Star Is Born. Original cassette release shown below. Original cassette release image below provided by Richard Allen.